Nikolai Andreyevich Rimsky-Korsakov (Russian: Николай Андреевич Римский-Корсаков, Nikolaj Andreevič Rimskij-Korsakov), also Nikolay, Nicolai, and Rimsky-Korsakoff, (March 6/18, 1844 – June 8/21, 1908) was a Russian composer, one of five great nineteenth-century Russian composers known as “The Five,” or “The Mighty Handful.” Rimsky-Korsakov later taught harmony and orchestration. He is particularly noted for a predilection for folk and fairy-tale subjects, one of the hallmarks of Russian Romanticism, and for his extraordinary skill in orchestration, which may have been influenced by his synesthesia (synesthesia is a neurological condition in which two or more senses are experienced simultaneously. Certain sounds, for example, might be perceived by the synesthete as having their own color). The use of folklore for musical motifs was guided by the Romantic sense that each nation or culture had its own animating spirit that would be expressed in its own national laws, customs, mores, government and arts. The "Mighty Handful," more than any other group of composers in Russia or the rest of Europe, were associated with this notion. Born at Tikhvin (near Novgorod) into an aristocratic family, Rimsky-Korsakov showed musical ability from an early age, but studied at the Russian Imperial Naval College in Saint Petersburg and subsequently joined the Russian Navy. It was only when he met Mily Balakirev in 1861 that he began to concentrate more seriously on music. Balakirev encouraged him to compose and taught him when he was not at sea (a fictionalized episode of Rimsky-Korsakov's sea voyages forms the plot of the motion picture Song of Scheherazade, the musical score adapted by Miklós Rózsa). He also met the other composers of the group that were to become known as "The Five," or "The Mighty Handful," through Mily Balakirev. While in the navy (partly on a world cruise), Rimsky-Korsakov completed his first symphony (1861-1865), which some have (mistakenly) deemed the first such piece to be composed by a Russian, although Anton Rubinstein composed his own first symphony in 1850. Before resigning his commission in 1873, Rimsky-Korsakov also completed the first version of his well known orchestral piece, the opera Sadko (1867) as well as the opera The Maid of Pskov (1872). These three are among several early works which the composer revised later in life. 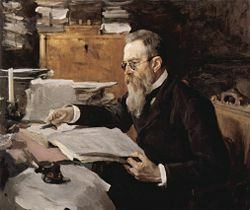 In 1871, despite his lack of conservatory training, Rimsky-Korsakov became professor of composition and orchestration at the Saint Petersburg Conservatory. 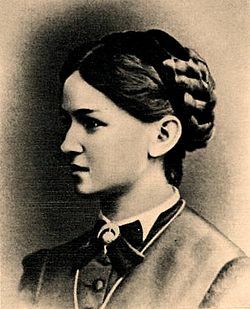 The next year he married Nadezhda Nikolayevna Purgol'd (1848-1919), who was also a pianist and composer. During his first few years at the conservatory, Rimsky-Korsakov assiduously studied harmony and counterpoint in order to make up for the lack of such training, despite his informal education during his years with The Mighty Handful. In 1883 Rimsky-Korsakov worked under Balakirev in the Court Chapel as a deputy. This post gave him the chance to study Russian Orthodox church music. He worked there until 1894. He also became a conductor, leading Russian Symphony Concerts sponsored by Mitrofan Belyayev as well as some programs abroad. In 1905 Rimsky-Korsakov was removed from his professorship in Saint Petersburg due to his expression of political views contrary to the authorities (1905 proved a turning point in the popularity of the Imperial government due to the events of Bloody Sunday and the Revolution of 1905, a precursor to the events of 1917). This sparked a series of resignations by his fellow faculty members, and he was eventually reinstated. The political controversy continued with his opera The Golden Cockerel (Le Coq d'Or) (1906-1907), whose implied criticism of the monarchy upset the censors to the extent that the premiere was delayed until 1909, after the composer's death. Towards the end of his life Rimsky-Korsakov suffered from angina. 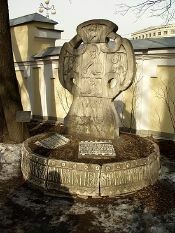 He died in Lyubensk in 1908, and was interred in Tikhvin Cemetery at the Alexander Nevsky Monastery in St. Petersburg. His widow, Nadezhda, spent the rest of her life preserving the composer's legacy. The Rimsky-Korsakovs had seven children: Mikhail (b.1873), Sofia (b.1875), Andrey (1878-1940), Vladimir (b.1882), Nadezhda (b.1884), Margarita (1888-1893), and Slavchik (1889-1890). Nadezhda married another Russian composer, Maximilian Steinberg in 1908. Andrey Rimsky-Korsakov was a musicologist who wrote a multi-volume study of his father's life and work, which included a chapter devoted to his mother Nadezhda. A nephew, Georgy Mikhaylovich Rimsky-Korsakov (1901-1965), was also a composer. The social upheaval of the French Revolution in 1789 and the attitudes it engendered, specifically the primacy of individual rights, signified an important cultural change for music and musicians The populist ethos surrounding the beginnings of Romanticism in Europe engendered a spirit of inclusiveness in which in turn led to music becoming more public and less private, a condition which allowed for greater exposure of high art. As composers of the Romantic era looked to literary and folk influences as inspiration for their creativity, this spawned numerous compositions based on the legends, folklore, history and mythology of their native countries. Composers such as Dvorak, Smetana, Grieg, Albeniz, to name a few, based a number of their works on these particular aspects. This too became a defining attribute of Romantic music. As a member of the "Mighty Five" in Russia (which included, Cesar Cui, Milay Balikirev, Modest Mussorgsky and Alexander Borodin) Rimsky-Korsakov was part of the vanguard of nationalist tendencies that permeated Russian culture of the late 19th century. Though Tchaikovsky was not a member of "the Might Five," he nonetheless utilized Russian folk music as source material and several of his operas are based on Russian legend. Rimsky-Korsakov often utilized folk melodies liturgical themes of the Russian Orthodox church in his music. This was a feature not only of Russian Romanticism, but Romanticism in music in general. Romanticism dominated music in the last half of the 19th century. In 1882, Russian author Vladimir Vasilievich Stasov wrote in a compelling essay entitled "Our Music" in which he asserted that Russian independence from past traditions (particularly German ones) was necessary for a "New Russian School" of music to emerge. Citing composer Mikhail Glinka (104-1857) as being the progenitor of a independent Russian school, Stasov called for Russian composers to follow Glinka's lead in developing a distinct national tradition. He wrote, " Our musicians need to verify everything for themselves according to their own lights, and only then will they acknowledge the greatness in a composer and significance of his work." For Stasov, striving for a "national character" meant connecting the tradition of high art with populist sentiment. Folk songs a part of nearly every aspect of Russian life and as such Stasov felt it to be imperative to use this rich folkloric material as the basis for Russian music. In his decades at the conservatory, Rimsky-Korsakov taught many composers who would later achieve international fame, including Alexander Glazunov, Sergei Prokofiev, and Igor Stravinsky. Rimsky-Korsakov's legacy goes far beyond his compositions and his teaching career. His tireless efforts in editing the works of other members of The Mighty Handful are significant, if controversial. These include the completion of Alexander Borodin's opera Prince Igor (with Alexander Glazunov), orchestration of passages from César Cui's William Ratcliff for the first production in 1869, and the complete orchestration of Alexander Dargomyzhsky's swan song, The Stone Guest. This effort was a practical extension of the fact that Rimsky-Korsakov's early works had been under the intense scrutiny of Balakirev and that the members of The Mighty Handful, during the 1860s and 1870s, experienced each other's compositions-in-progress and even collaborated at times. While the effort for his colleagues is laudable, it is not without its problems for musical reception. In particular, after the death of Modest Mussorgsky in 1881, Rimsky-Korsakov took on the task of revising and completing several of Mussorgsky's pieces for publication and performance. In some cases these versions helped to spread Mussorgsky's works to the West, but Rimsky-Korsakov has been accused of pedantry for "correcting" matters of harmony, etc., in the process. Rimsky-Korsakov's arrangement of Mussorgsky's Night on Bald Mountain is the version generally performed today. However, critical opinion of Mussorgsky has changed over time so that his style, once considered unpolished, is now valued for its originality. This has caused some of Rimsky-Korsakov's other revisions, such as that of the opera, Boris Godunov, to fall out of favor and be replaced by productions more faithful to Mussorgsky's original manuscripts. Rimsky-Korsakov was a prolific composer. Like his compatriot César Cui, his greatest efforts were expended on his operas. There are fifteen operas to his credit, including Kashchey the Immortal and The Tale of Tsar Saltan. The subjects of the operas range from historical melodramas like The Tsar's Bride, to folk operas, such as May Night, to fairytales and legends like The Snow Maiden. In their juxtaposed depictions of the real and the fantastic, the operas invoke folk melodies, realistic declamation, lyrical melodies, and artificially constructed harmonies with effective orchestral expression. Most of Rimsky-Korsakov's operas remain in the standard repertoire in Russia to this day. The best known selections from the operas that are known in the West are "Dance of the Tumblers" from Snowmaiden, "Procession of the Nobles" from Mlada, "Song of the Indian Guest" (or, less accurately, "Song of India,") from Sadko, and especially "Flight of the Bumblebee" from Tsar Saltan, as well as suites from The Golden Cockerel and The Legend of the Invisible City of Kitezh and the Maiden Fevroniya. Nevertheless, Rimsky-Korsakov's status in the West has long been based on his orchestral compositions, most famous among which are Capriccio Espagnol, Russian Easter Festival Overture, and especially the symphonic suite Scheherazade. In addition, he composed dozens of art songs, arrangements of folk songs, some chamber and piano music, and a considerable number of choral works, both secular and for Russian Orthodox Church service, including settings of portions of the Liturgy of St. John Chrysostom. My Musical Life. [Летопись моей музыкальной жизни —literally, Chronicle of My Musical Life.] Trans. from the 5th rev. Russian edited by Judah A. Joffe with an introduction by Carl Van Vechten. London: Ernst Eulenberg Ltd, 1974. Practical Manual of Harmony. [Практический учебник гармонии.] First published in Russian in 1885. First English edition published by Carl Fischer in 1930, trans. from the 12th Russian ed. by Joseph Achron. Current English ed. by Nicholas Hopkins. New York: C. Fischer, 2005. Principles of Orchestration. [Основы оркестровки.] Begun in 1873 and completed posthumously by Maximilian Steinberg in 1912. First published in Russian in 1922, ed. by Maximilian Steinberg. English trans. by Edward Agate. New York: Dover Publications, 1964. Rimsky-Korsakov, A. N. Н.А. Римский-Корсаков: жизнь и творчество (N.A. Rimsky-Korsakov: Life and Work). 5 vols. Москва: Государственное музыкальное издательство, 1930. Taruskin, Richard. "The Case for Rimsky-Korsakov." Opera News 56: 16-17 (1991–1992: 12–17 and 24-29. Yastrebtsev, Vasily Vasilievich. Reminiscences of Rimsky-Korsakov. Ed. and trans. by Florence Jonas. New York: Columbia University Press, 1985. ↑ *Harrison, John. 2001. Synaesthesia: The Strangest Thing. ISBN 0192632450. p.123. This page was last modified on 4 December 2018, at 17:52.